Our neighbors to the north, Canada, just went through a federal election in which a conservative government – one that had just lost a no-confidence motion that gave rise to this election – ended up strengthening their power for the next four years. It was an odd twist of events. 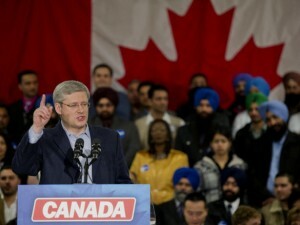 A noteworthy character of this election was the wooing of the ethnic minority vote – and especially of the Canadian Sikh vote – by all parties across the political spectrum. The influence of Sikhs in Canadian politics is not new. Canada first elected Sikh Members of Parliament in 1993 (Herb Dhaliwal and Gurbax Singh Malhi – the first to also wear a turban in Parliament), and since then, the impact of the Sikh vote and their participation in national politics saw an increasing trend. In this year’s election, it was an impressive display of the flex of Sikh muscle in Canadian politics as the courting of the Sikhs by politicians across Canada gained national attention. The blogger Maple Leaf Sikh discusses the results (and fallout) of the Sikh vote in that election on his blog. In several constituencies, most of the candidates were Sikhs themselves. Engaging and engagement of the Sikhs was so important in Canada that even the right-wing Conservative Party – the eventual victor who was historically never popular among Canadian Sikhs – actively sought Sikh support and fielded Sikh candidates. With such a national influence in Canada, could Sikhs achieve such prominence in the United States? The Canadian success owes a great deal to the specific situations of Canadian immigrant communities — situations very different from those prevailing among U.S. immigrant communities. Here were groups that were better educated than the Canadian average, more affluent than the Canadian average, more likely to own their own business, more likely to live in two-parent families — but who voted for the parties of the liberal Left because they did not feel culturally comfortable with the party of the Right. That’s a problem that can be fixed by communication and outreach. But the largest American immigrant communities are less educated, less affluent, less likely to own a business, and less likely to live in two-parent parent households than the American average. They vote for the party of the Left not only for cultural reasons, but also because they need and want more government assistance. The Republican problem with immigrant voters is bigger and more intractable than the Canadian Conservative problem. Sikhs wouldn’t be so easily categorized under the description given to “the largest American immigrant communities”. In terms of garnering a higher percentage of the vote, politicians in America would not likely get a lot of bang for their buck in collecting the Sikh vote as they do in Canada. Accordingly, while taking inspiration from our brothers and sisters to the north, American Sikhs – who would perhaps fall in the smaller group of higher education and income levels among minorities in the United States – may have to blaze our own trail to national prominence in this country. Its hardly ‘blazing a trail’ to use sectarian collectivism to form ghetto blocks in a small country like Canada. The delusions of some diaspora Sikhs is both funny and sad. when europeans live together in the same areas it is fine but when Sikhs choose to live amongst their own it is a problem? Birds of a feather flock together. Life is better when we can speak our ma boli Panjabi with our neighbours.